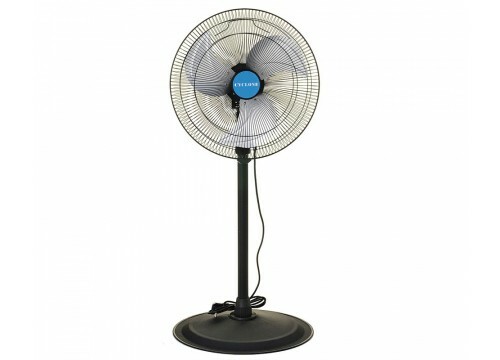 George's recommends the use of this 18inch pedestal fan in commercial and industrial applications such as gyms, clubs, bars, factories and warehouses or anywhere where rapid air movement is needed. This 18inch pedestal fan has a full steel construction giving it a strong and quality build and the 20inch base adds safety and stability. Its three precision balanced metal fan blades provide economical cooling and air circulation. The fan has 3 speeds all controlled at the rear of the fan; a 90° oscillating sweep and fixed head positioning to help cover larger areas for optimum cooling. The motor has thermal fuse, which, in the likely event of overheating the fan will shut down.